Raise your hand if you love the watercolor look but can’t really watercolor paint to save your life! If you could see me, I’d be raising my hand a little sheepishly. It takes a skill and talent that I always wish I was better at. 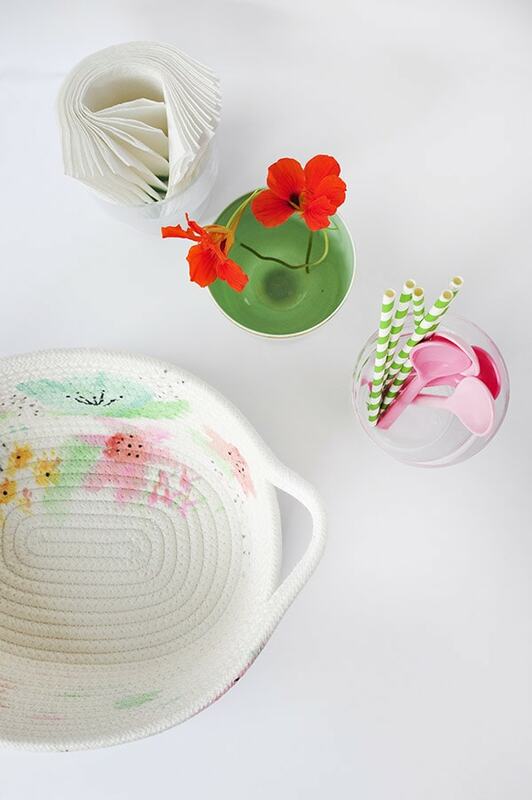 However, today I am showing how to get the LOOK of watercolor with my Easy DIY Watercolor Basket and it’s perfect for any skill level. 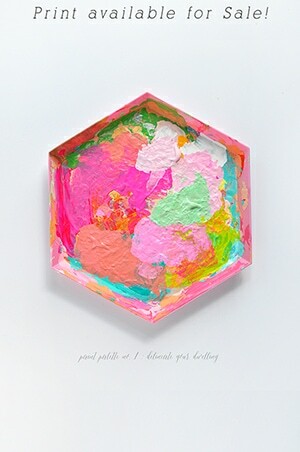 Now available – Paint Palette No. 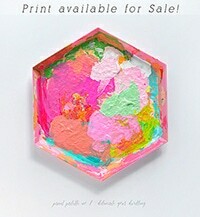 2 Photography Print of my paint palette pictured below!! 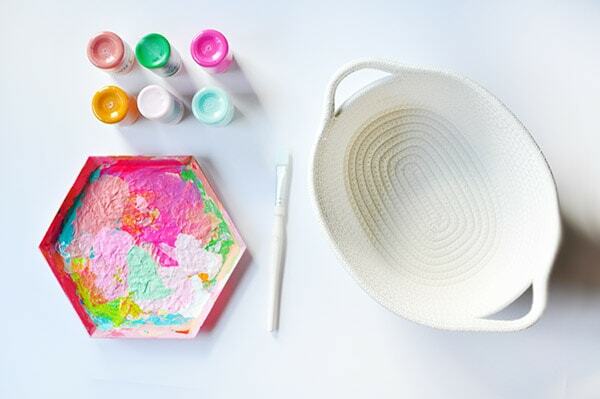 The trick to this watercolor basket is watering down your acrylic paints. I set out a glass bowl of water and watered down all the paint as I used it. I started first with blue flowers. Watering down my paint to be a very soft blue color, I created rough flower shapes. 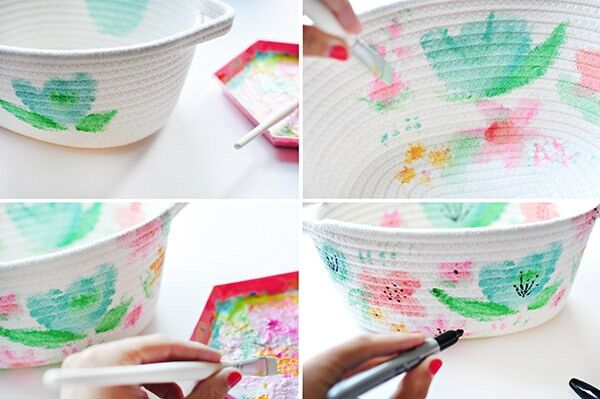 I painted mostly on the front of the basket and then on the back side of the inside of the basket. Next, I watered down a coral color and then a pink. Each new flower I painted, I started with a very watered down color and then gradually added more color to give it that watercolor look of layering. Once the paint had all dried, I used a black sharpie to create the flower accents. I also used a bronze sharpie to add dots and dimension in the white space. 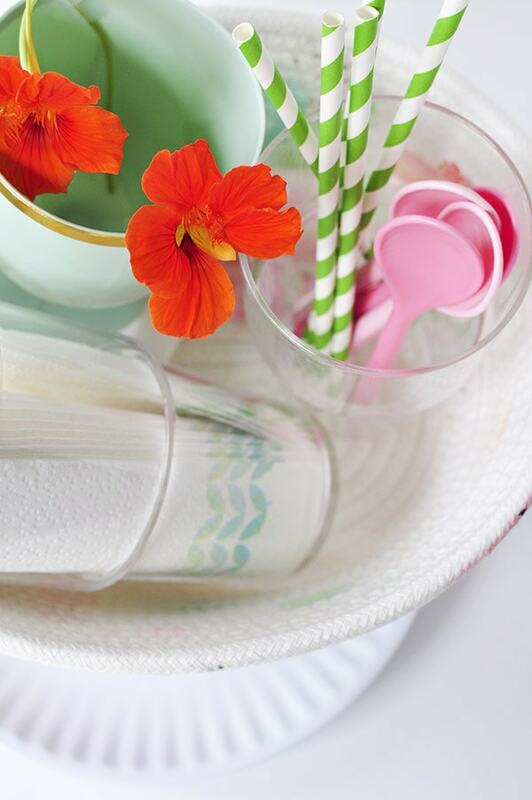 This basket really could have a million different uses! I used mine to hold my picnic goodies. Halfway through this DIY, I wasn’t so sure. So don’t give up if you try this one. It takes a few layers of paint to start really taking shape. Once it was complete, I was completely in love… halfway through, not feeling it. And side note, aren’t those orange nastrusiums from my garden just divine?!! So are you a watercolor master or a little more timid to try it like me? I honestly think your basket turned out beautiful! You’re very talented; if I tried this my flowers would be sadly lacking! 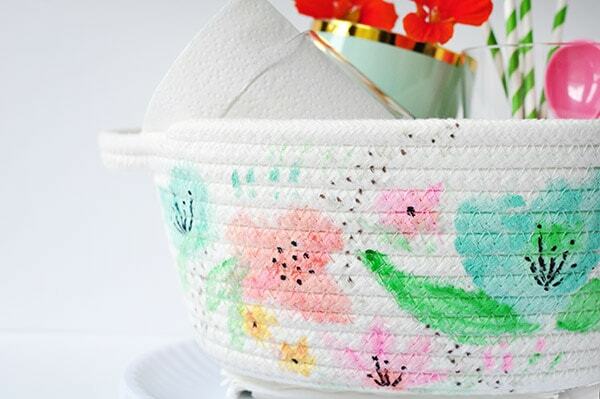 It’s a perfect one of a kind basket. Amy!!! This turned out seriously gorgeous. Pinned this one fo sho! 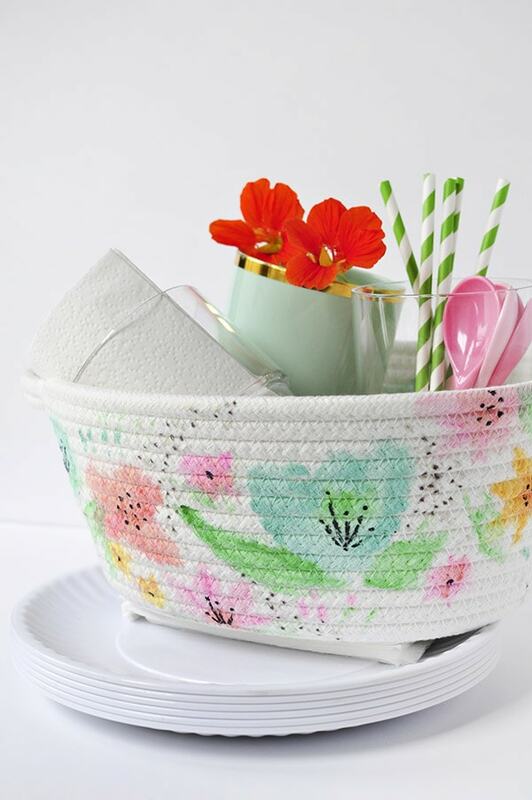 Stopped over from the Show and Tell Linky party…I love this basket! I’v been obsessed with all things watercolor lately, but have always been afraid to try. 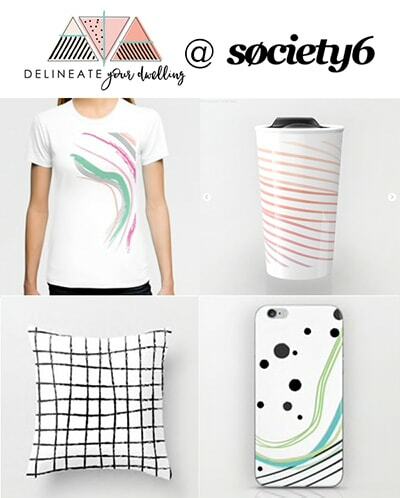 Thanks for giving me some great ideas to get started on my own! I’m pretty scared about watercolor, too! Somehow doing it on a basket that’s a bit lumpy and bumpy makes it less perfect and I just had a ton of fun with it. Good luck! Seriously, this is just so so pretty! 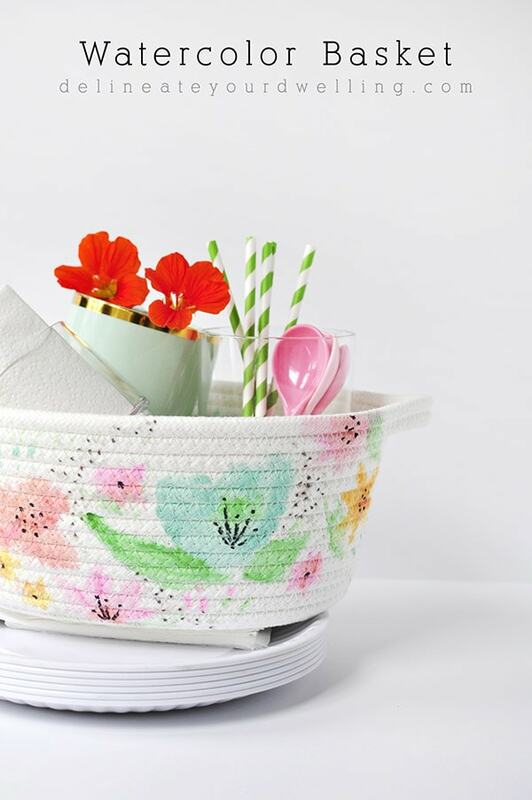 A very pretty basket with lovely hand painted flowers. Well done. So pretty! 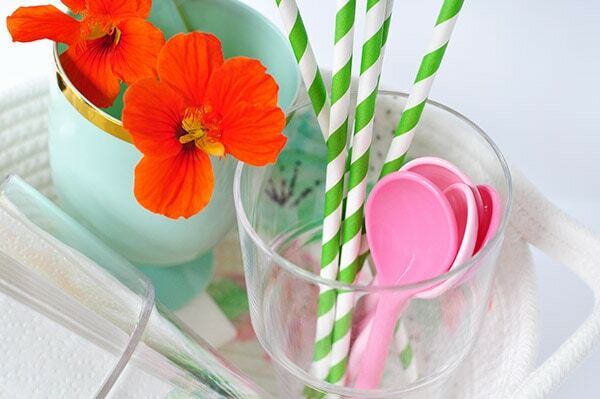 What a great way to make an everyday basket your own. Visiting from DIY Collective.